American soccer fans will have their eyes glued on Santa Clara Wednesday night as the United States takes on Jamaica in the CONCACAF Gold Cup final. 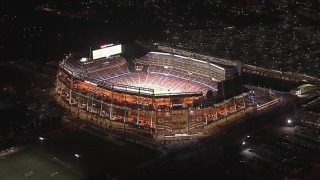 While fans focus on the action on the pitch at Levi's Stadium, officials will be tasked with mitigating traffic congestion in the area. Before the match kicks off at 6:30 p.m., Tasman Drive in front of the stadium will be closed at 9:30 a.m. Parking lots are set to open at 1:30 a.m. while gates will open three hours later. Santa Clara police are warning drivers to expect heavy traffic on Highway 101, Interstate 880, State Route 237, Lawrence and San Tomas expressways and Great America Parkway. Heavy traffic is also expected to clog the area after the game. Following San Francisco 49ers home games, officials usually turn all lanes of traffic in the area into one direction, allowing fans to get out of parking lots quickly. That won't happen Wednesday night because Great America and others local businesses are open. Those wishing to steer clear of the roads can use Caltrain, ACE Train and VTA to navigate to and from the game. The CONCACAF Gold Cup is a 12-team tournament featuring men's national teams from North America, Central America and the Caribbean. The United States won Group B and is coming off two 2-0 victories in the quarterfinals and semifinals. Jamaica finished second in Group C before topping Canada and Mexico to reach the championship match.